Montessori is a system of education for young children that seeks to develop natural interests and activities rather than use formal teaching methods. It was developed by Dr. Maria Montessori, a brilliant Italian physician, who was the first female doctor in Italy, specializing in pediatrics and psychiatry. The Montessori Method is a child-centered educational approach based on scientific observations of children from birth to adulthood. 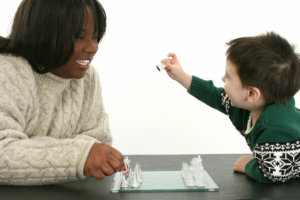 Dr. Montessori’s Method has been time-tested with over 100 years of success in diverse cultures throughout the world. It is a view of the child as one who is naturally eager for knowledge and capable of initiating learning in a supportive, thoughtfully prepared learning environment. It is an approach that values the human spirit and the development of the whole child—physical, social, emotional, and cognitive. By 1925, more than 1,000 Montessori schools had opened in the United States. By 1940, the Montessori movement had faded, but it was revived in the 1960s. Today, the North American Montessori Teachers’ Association estimates that there are about 4,500 Montessori schools in the United States and about 20,000 worldwide. Check out the video for a quick overview of the Montessori Method. While teaching at her medical-school alma mater, Dr. Montessori treated many poor and working-class children who attended the free clinics there. During that time, she observed that intrinsic intelligence was present in children of all socio-economic backgrounds. She became the director of the Orthophrenic School for developmentally disabled children in 1900. Dr. Montessori’s success with developmentally disabled children spurred her desire to test her teaching methods on “normal” children. In 1907, the Italian government afforded her that opportunity, and she was placed in charge of 60 students from the slums, ranging in age from 1 to 6. The school, called Casa dei Bambini (or Children’s House), enabled Dr. Montessori to create the “prepared learning” environment she believed was conducive to sense learning and creative exploration. Teachers were encouraged to stand back and “follow the child”—that is, to let children’s natural interests take the lead. Over time, Dr. Montessori tweaked her methods through trial and error. Her writings further served to spread her ideology throughout Europe and the United States. By 1925, more than 1,000 Montessori schools had opened in the United States. By 1940, the Montessori movement had faded, but it was revived in the 1960s. Today, there are there are about 4,500 Montessori schools in the United States and about 20,000 worldwide. Once World War II began, Dr. Montessori was forced to flee to India, where she developed a program called Education for Peace. Her work with the program earned her two Nobel Peace Prize nominations. Maria Montessori was born on August 31, 1870, in the provincial town of Chiaravalle, Italy, to middle-class, well-educated parents. She died on May 6, 1952, in Noordwijk aan Zee, Netherlands.